A much improved West Indian performance and suddenly it’s 154 runs or 5 wickets. However, with the last 4 of those real tailenders, Ramdin and Chanderpaul really need to dig in to secure any hope of keeping the series alive until Durham. Follow the cricket once it starts on Cricinfo and leave your comments below. Though if you have a spare tenner, that’s all you need to get in. Dwayne Bravo dismissed Kevin Pietersen yesterday, hit wicket, when a bouncer zeroed in on his head, smashing his helmet off which then landed on his stumps. Here’s the video. Fascinating to see Bravo’s euphoric celebration while Pietersen stands there, stunned and shocked. England were complacent with the bat yesterday, and now rely on Ian Bell to marshal the tail for a good score. Will Steve Harmison reproduce his destructive form from last year? Or will the West Indies overcome their inexperience and demonstrate some steadfastness on the most bowler-friendly wicket of the series so far? Follow the action at Cricinfo and leave your comments below. Right. So, is anyone else a bit bored? Was anyone else bored by large parts of today? I was, and looking at the scorecard I have absolutely no reason to be anything other than full of adrenaline. Instead, I just feel “eh” and I don’t know why. It wasn’t without incident. The period of play when Fidel Edwards steamed in, supported by Jerome Taylor at the other end, was West Indies’ most captivating of the series. Seven wickets, nearly 300 runs and yet I was left with a feeling that nothing memorable happened. Perhaps it was that no England batsman “went on” to a hundred. Maybe it was West Indies’ laughably awful fielding. It could even just be a form of professional detraction from the emotions of watching your country play. But I’m unsettled by it and think it has more to do with knowing that, in spite of West Indies’ improved display, tomorrow England ought to blow them away. 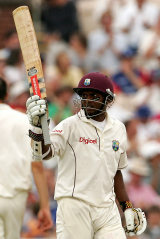 It is utterly depressing seeing West Indies in this state; watching Corey Collymore trundle in like a baying donkey. He was frighteningly quick a few years ago but stress fractures and other nasty injuries have taken their toll. Edwards was severely sharp but, as one “staff” member of the Windies party told me, they cannot risk him bowling more than five overs at a time. As an England fan, I thought they were distinctly poor today. West Indies did put the ball in better areas (a phrase which, someone recently told me, is absolute nonsense: you can’t put a ball in more than one area at a time! Ah the pedantry of journalism) but England looked distracted and, well, a bit bored too. Clearly I am talking a load of nonsense. Thoughts welcome.